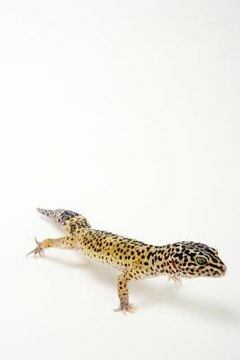 Leopard geckos, as ground-dwelling lizards, depend on heat levels between 75 degrees at night to 90 degrees during the day to remain healthy and active. If you're having trouble keeping the habitat temperature in this range, try one of several simple solutions to keep your gecko warm and cozy. Leopard geckos require warm ground in their environments, since they spend most of their time there. Some reptile substrates are poor conductors of heat, and may cause gradual cooling of the lizard's habitat. Substrates such as very fine beach sand and bark mulch tend to lose heat quickly, so should be avoided. The best substrate for leopard geckos is a combination of pea gravel at the bottom of the habitat, with a coarser sand (such as generic playground sand) on top. This combination will conduct and retain heat much better than other substrates. An incandescent bulb of 40 to 60 watts in a reflector fixture is one of the simplest ways to add both heat and light to a leopard gecko's habitat. This bulb can be placed over one half of the habitat, to allow the gecko to self-regulate his temperature. You may also choose a red light -- since leopard geckos are nocturnal, a red light bulb will not interrupt their normal sleeping patterns. Keep a thermometer in your leopard gecko habitat to make sure the temperature stays between 75 and 90 degrees at all times. Turn off heating devices if the cage gets too warm. You may need to buy a lower-powered heating pad or light if the habitat is consistently too warm.